In early 2010 I learned I had a "suspicious" mass in my right breast. Two days later my husband of 18+ years announced he was leaving me. This meant I'd also soon be unemployed since my job at the time was as Office Manager for a business my then-husband and I ran together, and that lengthy period of unemployment also led to the eventual loss of my home. To Hell And (Hopefully) Back is my memoir of learning first to survive, and then to thrive. In first section of this memoir I reprint every post from my To Hell & (Hopefully) Back blog, where I chronicled my experiences during the first year after being hit with all of these major life traumas simultaneously. In the second section I share what I've learned along the road to recovery, and how I've found my way through to a 'new normal'. In the last section, The Crash Cart, I provide the survival tips I used to tie a knot and hang on at those times when I was sure I'd reached the end of my rope. This is a book for anyone who's trying to cope with a loss or tragedy that seems too big to endure. What I share in this book is my experience in living the old proverb from Lao Tzu: "Sometimes new beginnings are disguised as painful endings." It's been a long time coming, and a tough slog. But the point of the book is that I survived. Little 'ol me, who was a creature of habit, a perfectionist and control freak, survived having everything I'd always taken for granted forcibly, suddenly ripped out of my life. I can tell you this much: I'm not a perfectionist anymore and while I still prefer structure to disorganization, and knowing to not knowing, I've definitely learned how to loosen my grip on things that are, or should remain, outside my control. I used to say, only half-jokingly, that I should just join the Navy SEALS because after all I've been through, it's obvious that nothing can kill me. This is the book that tells that story. 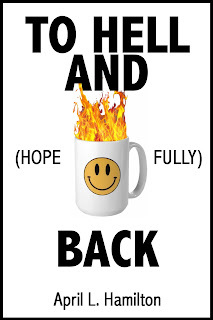 To Hell And (Hopefully) Back is now available exclusively in Kindle format, for the Kindle, Kindle Fire, or any of the free Kindle reader apps for PCs, Macs, and Android and Apple mobile devices. I've left the first several entries from the original To Hell & Hopefully Back blog up, as a free preview. Anyone who'd like to review the book can write me at indieauthor@gmail.com to request a free copy. I remember those blog days and buying all your books in support. You've dome a long way!